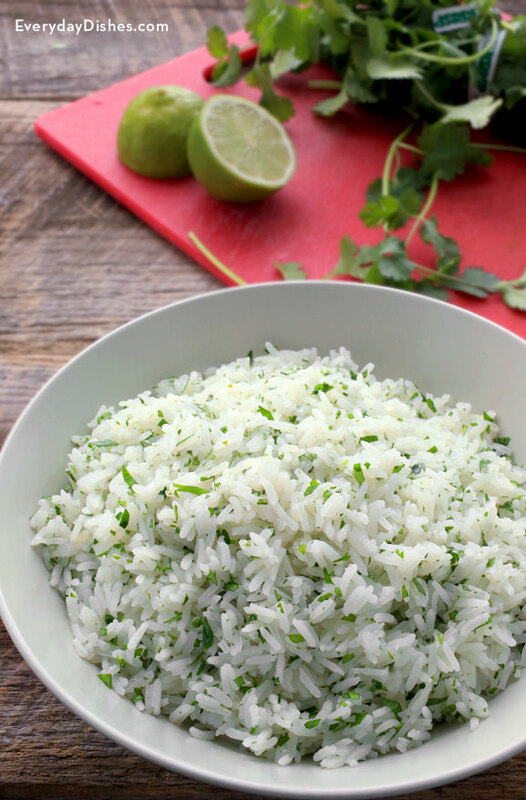 You can make our recipe for cilantro lime rice ahead of time and use it for almost anything—fill burritos, lay it down as a bed for Mexican stew, or just eat it as a tasty side. It’s really easy to make and so flavorful. Combine it with some of our other favorite recipes like Mexican green chile pork stew or pepper and onion quesadillas. Serve it all up for a fun Mexican fiesta! Be sure to stir the rice carefully and give it some time to rest once it’s done cooking. Otherwise, it will end up being too tender and may turn into paste as you start to mix in the lime juice. Add rice, water, salt, bay leaf and oil to a large saucepan and stir to combine. Bring to a full rolling boil over high heat then cover and reduce heat to low. Simmer 15 minutes or until water is absorbed. Remove from heat and allow rice to sit undisturbed for 5 minutes before removing the lid. Remove bay leaf and drizzle lime juice over rice and carefully fluff with a spoon then stir to combine rice and lime juice. Add chopped cilantro and toss to combine then season to taste with salt. Serve hot. This is one of the most versatile rice recipes you’ll ever make!